This latest made-for-TV exercise in moronic science contains, as many do, a well-conceived and executed synth-and-samples score that elevates the drama, if not making up for the goofy premise and inconceivable scientific framework of the story. Following a catastrophic journey to space, the solar system is shaken by unusual activities that have a devastating effect on our planet. People all over the world struggle for survival while a couple of brave heroes try to stop the destruction at risk of their own lives. Canadian film composer James Gelfand (PINOCCHIO 3000, CRUSOE) has crafted music that propels the story and escalates the film’s sense of drama with sensitivity and eloquence. 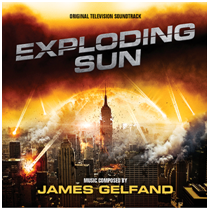 With a pair of themes at its foundation (a heroic adventure motif emphasizing the nobility of the space mission at the start and in the ongoing struggles to save the world, and a progressive, 4-chord tension-building motif), Gelfand’s score is nicely grounded in (sampled) orchestral rhythm and progression. The score carries itself well on the album and the composer’s use of the synthetic samples is effective, if some of the sustained chords inadvertently sound a bit false. “To The Moon” and “First Flight” embody the heroic theme with eloquent style, while the tension theme is introduced in “Race Against Time” and then is especially well played to evoke cosmic peril “Angry Sun.” Gathered to a climax in “The End is Coming,” the composer’s themes here feature some fine violin writing to accentuate the growing chord progression). As part of the film is set in Afghanistan, Gelfand very subtly draws some of his textural palette from the ethnic music of the region; elsewhere he has ample opportunity to compose poignant moments in such cues as “Last Goodbyes” and “Losing a Friend,” where the hero theme is subdued with heartfelt sadness; the latter includes a striking Middle Eastern vocalise (also nicely heard in “Passage Through the Desert”) along with finger cymbals to create an softly expressive soliloquy. A rhythm pad of keyboard notes over strokes of violin creates urgency for the activities to save the world (“Trouble in Afghanistan,” “Save the Earth”). The Afghanistan motif along with the tension and hero themes are reprised in a comforting resolution in “The End.” Nicely done, and a good choice for preservation by the label. Review originally published in Soundtrax, by Randall D. Larson 12/8/13.